EXCITEMENT UNFOLDS ON EAST 59TH! Picture a woman, a man, a big city and a chance meeting that would launch the career of a lifetime. As we furtively glanced at each other in the luscious decor of the Hawthorn Room, I immediately knew that a truly exciting path was ahead. My name is Evelyn Weaverton and my life completely changed the day he discovered me. That is until she arrived on the scene, the mane of all my troubles, the one everyone in the industry loved to hate, Constance Madssen. I found fame, drama and love on East 59th, wrapped in the arms of glamour. This Spring, follow our adventures and together we will shine like no one ever has before! I found fame, drama and love on East 59th, wrapped in the arms of glamour. This Spring, follow our adventures and together we will shine like no one ever has before! When suave and stylish New York dandy Laird Drake formed the Drake Agency, little did he know that he had just set in place the first stone of a drama that would unfold on East 59th. Soon joined by Constance Madssen, his first high-profile model, his girls would soon become the most sought-after faces to advertise all sorts of glamorous products. From the slimmest, smoothest, most fashionable cigarette brands of the day, to the latest shades of makeup and hair color, Constance was working non-stop, that is, until sweet and innocent Evelyn came about. That is when everything hit the proverbial fan and one of the most publicized feuds of the industry began. Constance Madssen™ is a fully articulated 12.5 inch doll with rooted hair and hand applied eyelashes. Constance Madssen makes an explosive debut in her first big gig as the spokesmodel for “Markboro”, the most fashionable cigarette brand of 1951! Ready for a pin-up pose in the posh settings of some of her favorite New York watering spots, the images that came out of this photoshoot are still being referred to decades later as pure genius by industry insiders! This incredible doll comes complete with all of the components needed to transform her fabulous look from day-to-night and back again, unveiling just enough skin to make every lady want to be her and every guy want to be with her. Of course, no modeling gig would be complete without the product to advertise (and be seen with!) and Constance has her own miniature pack of Markboros and a signature cigarette holder (even though rumor has it that, years later, she became an advocate against the tobacco industry! Laird Drake knows how to pick a winner when he sees one and he definitely hit the jackpot when Evelyn Weaverton walked into his life! No one had ever seen such fire mixed with innocence before! With her kind, beautiful eyes and her stylish demeanor always on-point, he could have given her the moon on the spot to snag her for his agency, much to the dismay of his other prima donna, Constance Madssen. Was the city big enough to have two such incredibly beautiful stars competing for success under the same roof? Evelyn Weaverton™ is a fully articulated 12.5 inch doll with gorgeous rooted hair and features hand applied eyelashes. Meet Evelyn, dressed in the very first ensemble she was wearing the day Laird Drake discovered her! Newly arrived in the Big Apple, Ms. Weaverton opted for an eye-catching look that can easily transform from a stunning day look to a glamorous evening look with just the switch of a few pieces! The look comes with jewelry that perfectly complements the shade of her electric blue satin outfit, two pairs of assorted retro-looking shoes and a makeup set to ensure that she’s perfect for her first close-up under the Drake Agency banner! Sweet and delicate Evelyn Weaverton truly made her mark in the modeling world as the one every woman wants to emulate. On the page, she’s just gorgeous and sophisticated; in other words, the perfect all-American trophy gal every red-blooded male wants to be seen with. However, reality can be quite different. This girl has the determination of an Olympian and no man can come between her and her dreams. Unless maybe, that man is Laird Drake? After all, he did discover her and she owes him a lot! Evelyn Weaverton™ is a fully articulated 12.5 inch doll with fully rooted hair and features hand applied eyelashes. Ms. Weaverton shows us her favorite shimmery evening look, as she was hand-picked to be the “eye candy” for the launch of a new vintage of champagne. 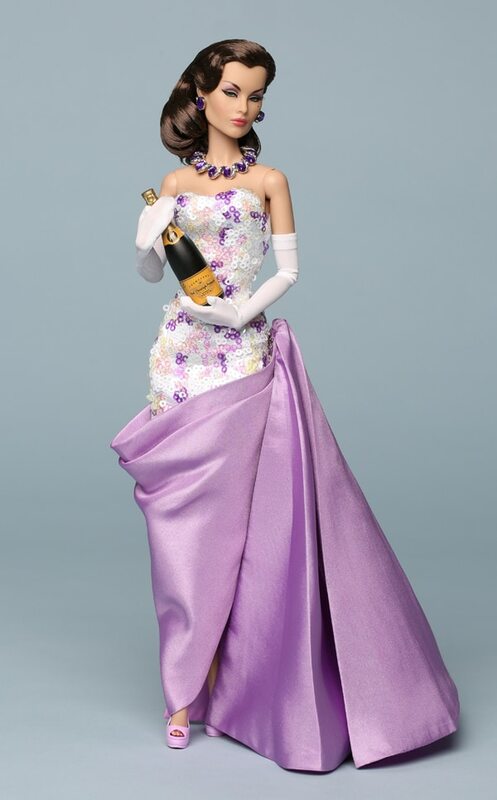 With its removable, perfectly draped lavender train, Evelyn’s elegant gown transforms from a look designed to “wow” any crowd, to a sophisticated cocktail attire to better work a room filled with millionaire socialites, promoting the delicious new spirit! Laird Drake’s sponsors could not be happier! 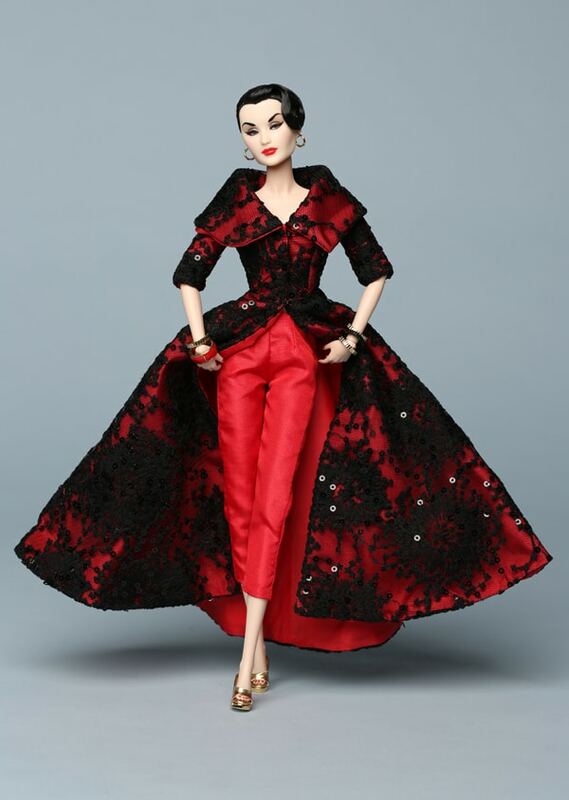 This stunning doll comes complete with an specially-marked miniature bottle of Veuf Christoph Pomarin Cuvée 1951 champagne, two champagne flutes, long opera-length gloves, a stunning floral head piece, jewelry and a pair of retro-looking molded shoes. Constance Madssen™ is a fully articulated 12.5 inch doll with rooted hair and hand-applied eyelashes. Ms. Madssen is about to show the world what she is truly capable of in her perfectly tailored costume that can effortlessly go from day to night with just a few simple changes of accessories! 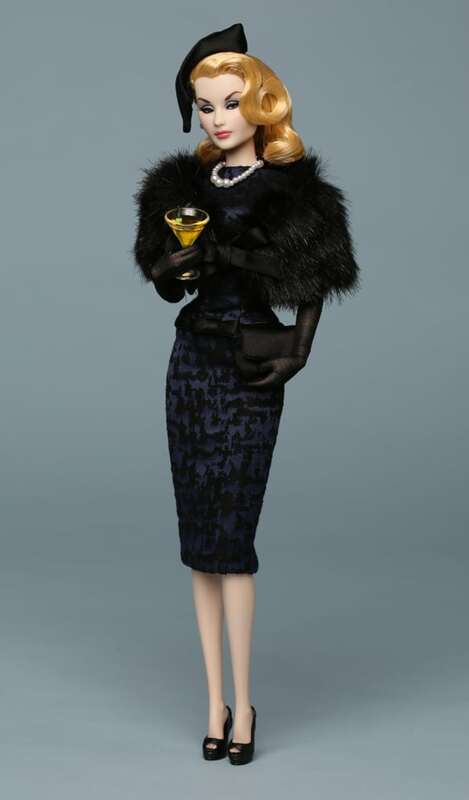 This stunning doll comes complete with two different pairs of shoes, a “fur” stole, two cocktails (perhaps for a two-cocktail lunch or to help Laird Drake make her an offer she can’t refuse?! 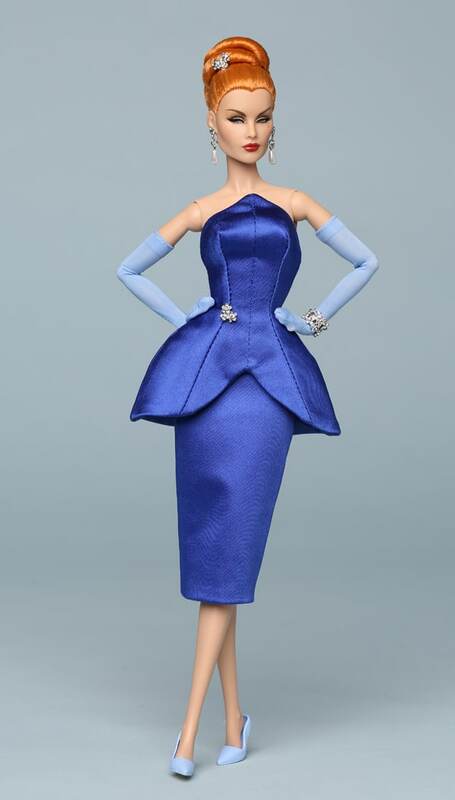 ), a perfectly doll-sized menu from the swanky Hawthorn Room (the place where everyone on East 59th likes to hang out and gossip), a chic hat, a clutch, gloved hands and those delicate pearls she likes to twirl between her little fingers. The same fingers she’ll soon control the world with!